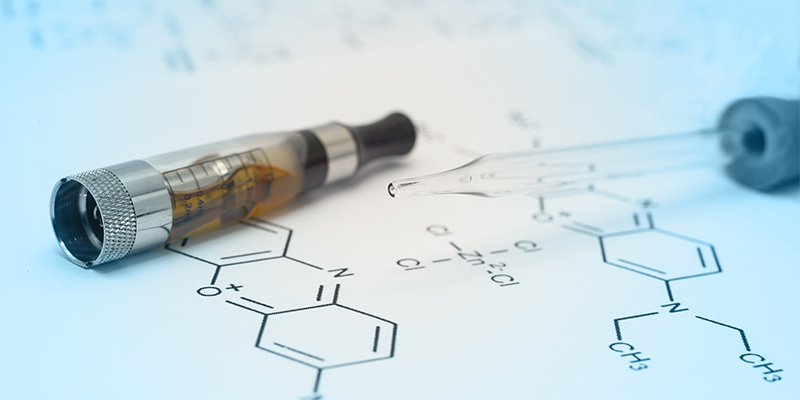 Recent developments in the understanding of e-liquid safety and the effect of some of the flavour components have led to increased scrutiny across the industry with regards three key compounds. While these three compounds are used safely in food, special consideration must be given to inhalation use because the lungs are not equipped with the same level of defence mechanisms compared to the stomach i.e. when something is swallowed. This blog discusses these compounds of interest, why they need to be monitored and how Liberty Flights is ensuring the quality and safety of our e-liquids. 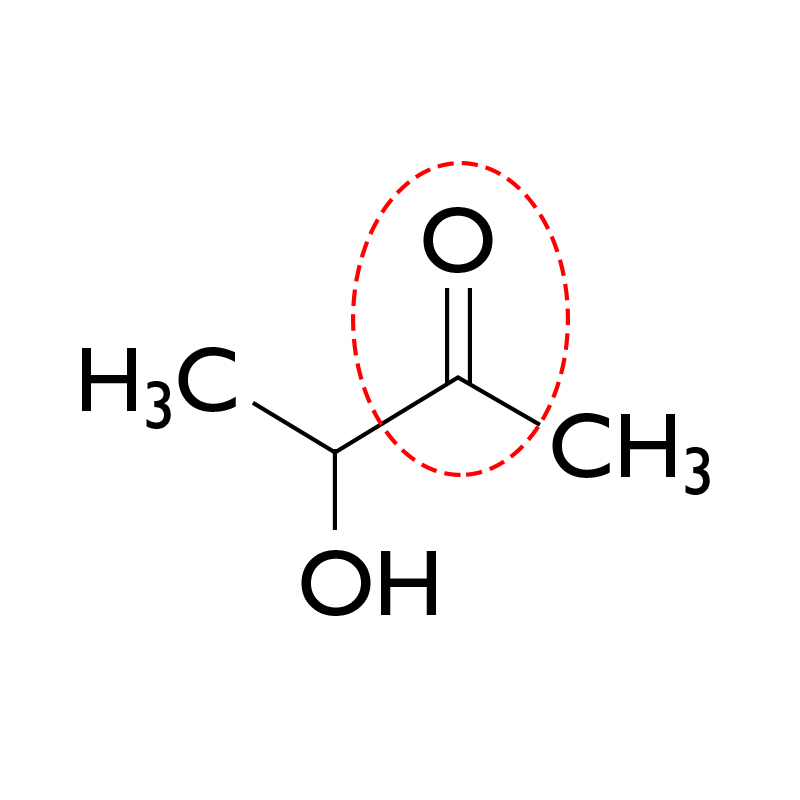 It is classified as an alpha diketone (two C=O groups, side-by-side, ringed in red) and has an intense, buttery flavour. This means that it is often added to food as a flavouring agent but it can also occur naturally in alcoholic beverages. What is Acetyl Propionyl (AP)? AP also has a buttery taste and can be found in food flavourings. Acetoin is described as having a pleasant buttery odour, making it a popular food flavouring. It is also a chemical intermediate in the production of DA. Why shouldn’t they be present in e-liquids? During the use of DA as a flavouring for butter popcorn in the US, it was discovered that workers exposed to the flavouring during manufacture were at risk of Bronchiolitis obliterans (BO). BO is a rare and life-threatening form of non-reversible obstructive lung disease in which the bronchioles (small airway branches) are compressed and narrowed by fibrosis (scar tissue) and/or inflammation. After investigation, it was concluded that DA contributed to the damage caused and there is good data to support the presumption that both DA and AP are dangerous if inhaled (see links below). Evidence suggests the respiratory damage is linked specifically to the functional group of these molecules (an alpha diketone). What is most concerning is that the maximum exposure limits for DA and AP are very low and it is vital that these compounds are tested for, at the lowest possible level, in any inhalation product. The recommended exposure limit (REL) for DA is 5 parts per billion (ppb) as an eight-hour, time-weighted average, (TWA) during a 40-hour work week. For AP the REL is 9.3 ppb(1). This data has been applied to e-liquids by registered toxicologists (BIBRA Toxicology and Consulting) contracted by ECITA (Electronic Cigarette Industry Trade Association), who have set limits for DA and AP to 20 µg/ml in e-liquids, based on a daily consumption of no more than 3 ml of e-liquid per day. The possible inclusion of DA and AP, at any level, in some sweet tasting e-liquids is therefore a concern to the industry in general. According to the British Standards Institution (BSI) PAS 54115:2015 (Vaping products, including electronic cigarettes, e-liquids, e-shisha and directly-related products – Manufacture, importation, testing and labelling guide) these compounds are not permitted in the production of e-liquids. 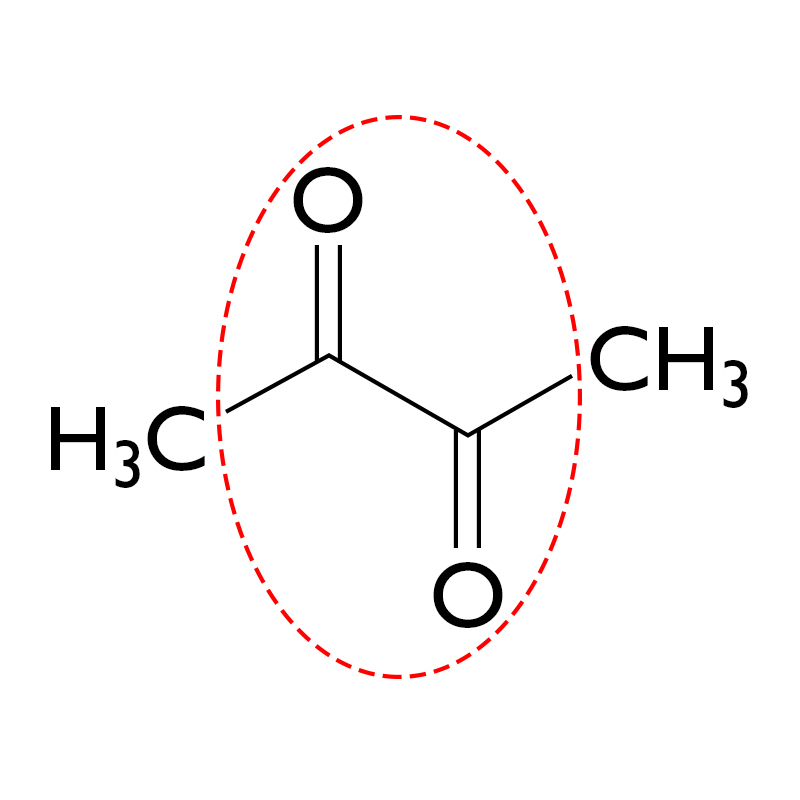 Although not a diketone, there is conflicting evidence about the effect of acetoin on the body when inhaled. What is known is that it is a respiratory irritant and combined with the fact that it is an intermediate in the formation of DA, it has become a compound of concern. Bibra have quoted a safe level of 8400 µg/ml and Liberty Flights Ltd has chosen to test for and monitor acetoin levels as more data continues to become available. Liberty Flights has taken the step of having our e-liquids tested at an independent, GMP laboratory to confirm that the level, if any, of DA, AP and acetoin are within acceptable, safe limits for inhalation. How and where is the testing performed? In order to get the highest quality, reputable data, Liberty Flights approached a well-known independent, GMP (Good Manufacturing Practice) laboratory and undertook extensive method development to create a method which had the highest possible level of sensitivity, despite the often complex mix of flavourings. It was important to Liberty Flights to use an accredited laboratory that would perform the testing to the highest standard so selecting one with GMP approval was vital. GMP outlines the standard required in order to conform to legislation covering pharmaceutical manufacture and testing. As a result, standards are very high and ensure reputable, repeatable data is obtained. Using an independent laboratory was also important to Liberty Flights, as we wanted the results to be unbiased, giving our customers confidence that the results were verified independently without interference from anyone invested in the outcome. 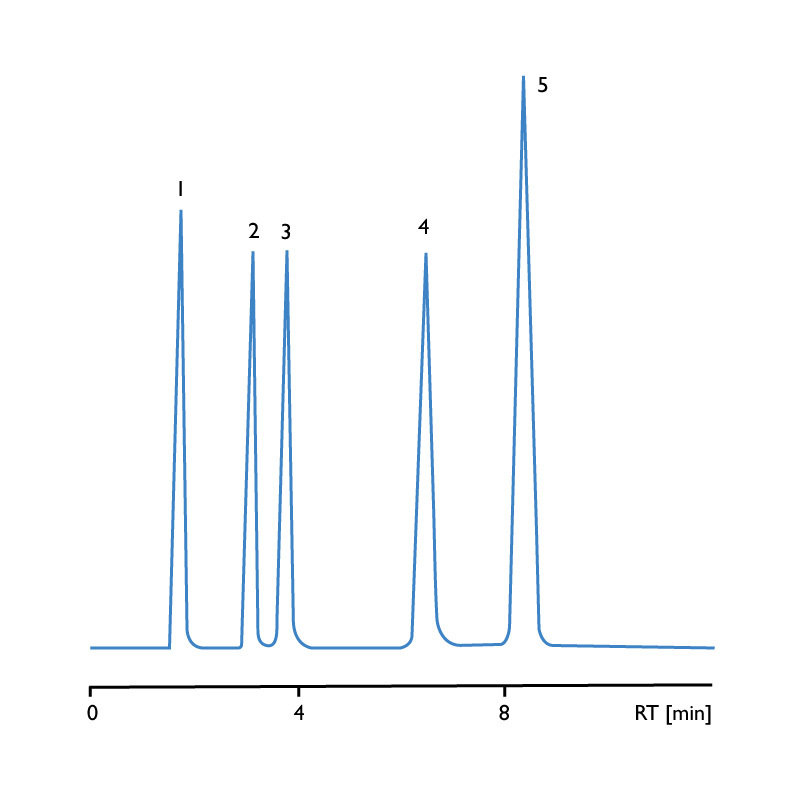 The method for detecting and quantifying DA, AP and acetoin uses High Performance Liquid Chromatography (HPLC). This approach separates compounds of interest from each other in the e-liquid. In HPLC, the sample is passed through a column (usually containing silica based packing), with a flowing solvent mixture through the system. Based on their structure, the individual components in the e-liquid sample have unique affinities for the packing material (i.e. silica) and the solvent mixture, and retain on the column for different periods of time relative to that affinity, before being eluted. This allows the different components to be detected as discreet peaks at different times by the detector. The concentration can then be calculated based on the intensity of the response to that compound in the detector (area under peak). This is a widely used analytical technique and the method development carried out by the laboratory ensured the limit of detection (LOD) and limit of quantification (LOQ) for the method was as low as possible whilst maintaining precision and specificity. 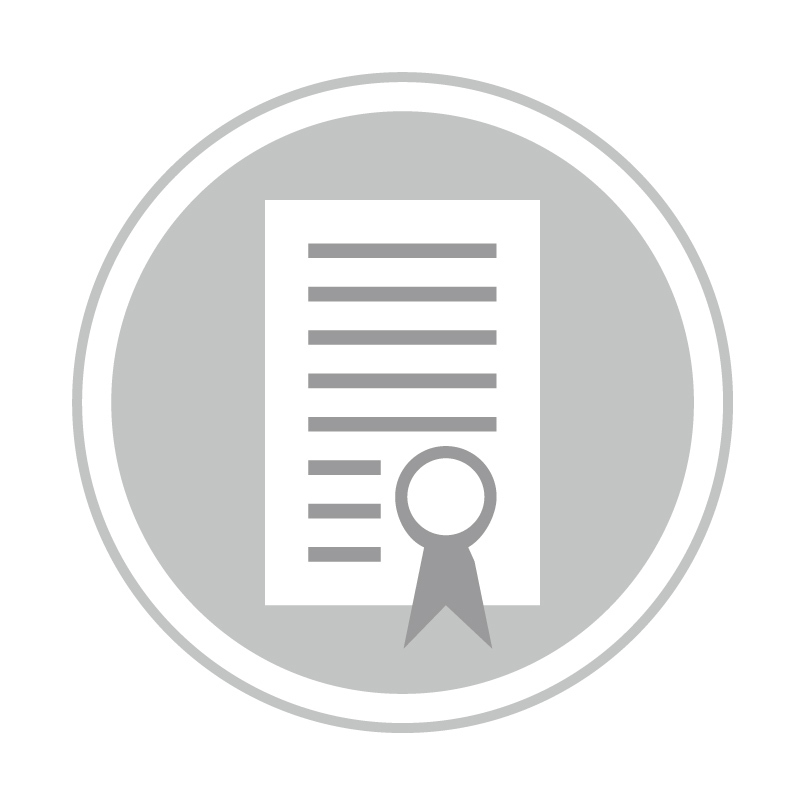 The certificates for the first 27 liquids tested can be found where you see the certificate symbol next to any flavour on the product pages. Due to the number of liquids available, this process is ongoing and as more results become available they will be published on the relevant product pages of our website. For reference, 1 µg/ml equals 1 ppm and therefore, the safe limit of 20 µg/ml referenced previously equals 20 ppm for DA and AP and 8400 µg/ml equals 8400 ppm for Acetoin. The limits of detection for the methods used to conduct this testing are 2 ppm. It can therefore be said that any e-liquids showing a result of ‘none detected’ (ND) have levels below 2 ppm and are therefore well within safe limits. Liberty Flights is pleased that the results reflect the thorough approach taken to e-liquid quality. 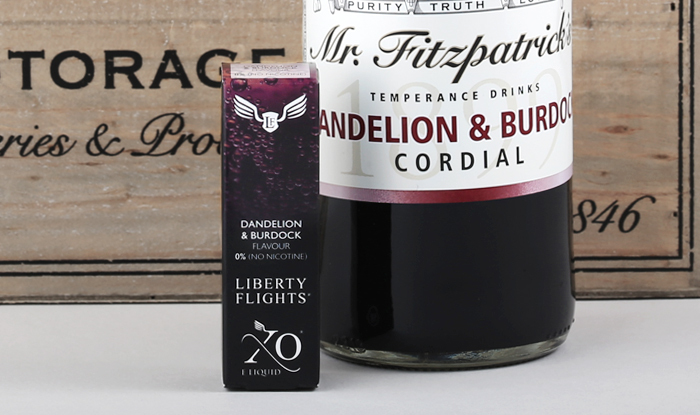 At Liberty Flights all of our guest e-liquid manufacturers are required to supply the appropriate certification on DA, AP and acetoin levels to ensure we only sell the best quality products. Please contact the manufacturer directly for more information. Liberty Flights will continue to invest resources into scientific development to ensure that we produce e-liquid that is of the highest quality and is as safe as it can possibly be. If you have any questions about this blog, or anything else about Liberty Flights products, please feel free to get in touch via our customer service team or leave your comments below and we will do our very best to get back to you as soon as possible. 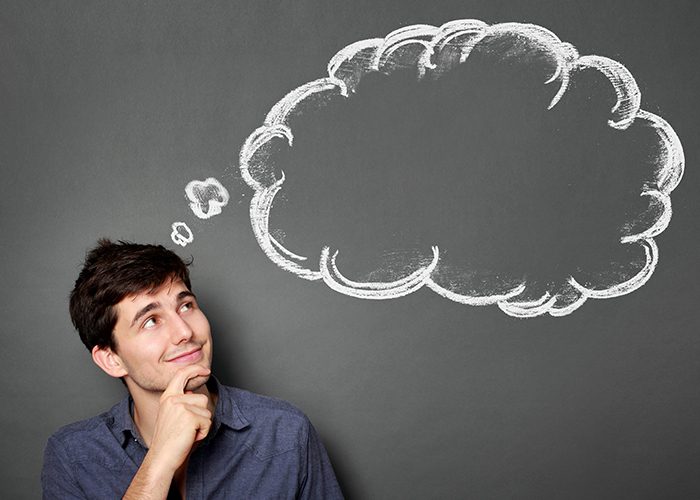 How do e-cigarettes satisfy my nicotine craving vs. traditional cigarettes? 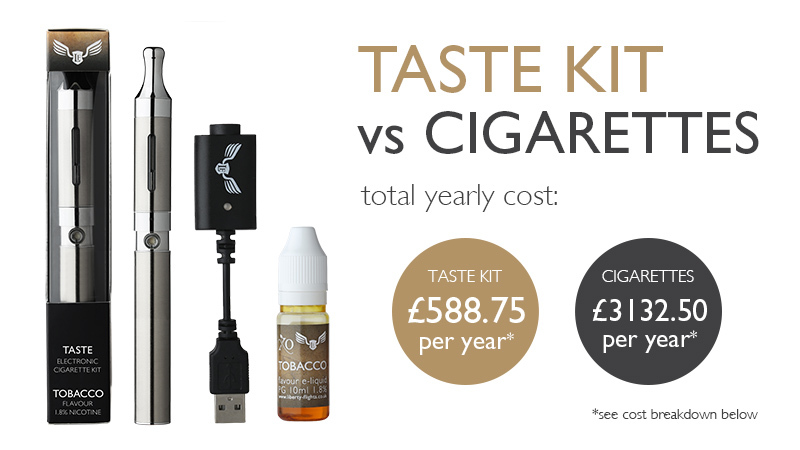 Accurately estimating the cost and other benefits from switching to e-cigarettes can be challenging and requires a good understanding of the vast differences between e-cigarettes and traditional cigarettes. Therefore, the objective of this blog is to discuss these key differences to help you more accurately predict the cost savings and other benefits from initially switching to e-cigarettes and throughout each stage of your vaping journey. 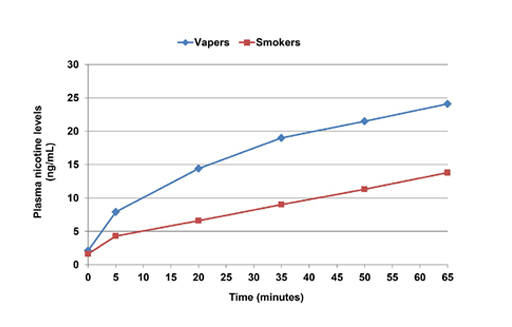 Figure 1 shows the average nicotine plasma concentration vs. time profiles for experienced and first-time study participants using the same device and e-liquid containing 1.8% (w/v) nicotine. 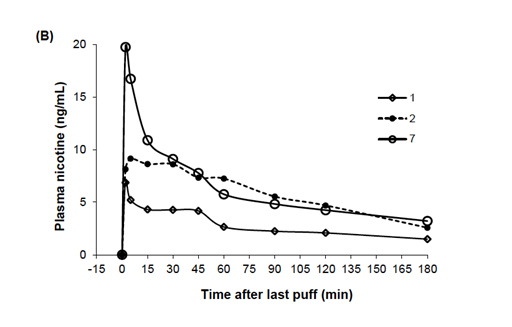 While no statistical differences were observed at the start of the experiment (8 hours of nicotine abstinence), the data illustrate a significant difference in nicotine absorption for all following time points. Unfortunately, the variability within each group is not shown in Figure 1. Overall, the results indicate that first-time users are unable to obtain similar nicotine levels as experienced vapors even when using the same device. Table 1. Participants’ usual e-cigarette and e-liquid used in the study. Adapted from Tables 1 and 2 of reference 9. E-cigarette popularity is attributed to their ability to satisfy nicotine cravings more efficiently than other nicotine replacement therapies.5,9 Moreover, they also mimic the behavioral addiction more so than any other nicotine replacement product. 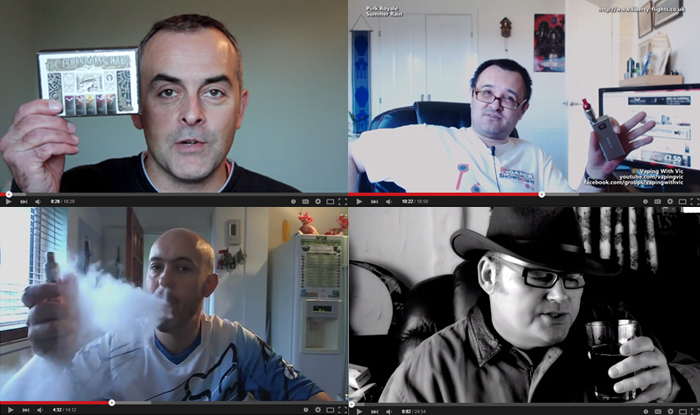 The wide variety of devices is an attraction for experienced e-cigarette users but can be intimidating to a novice. If you are completely new to vaping, it is extremely important to take the time to learn about their various features and how to properly care for them. Liberty Flights recommends using a 2nd generation device to begin your vaping journey but encourages you to adapt your puffing style to maximise the nicotine intake from e-cigarettes. Initially, you may need to take more puffs throughout the day to satisfy the nicotine craving you get from cigarettes. It’s important to keep in mind that smoking a cigarette has a beginning and end whereas you will most likely vape throughout the day. Another advantage with vaping is that you can do it in most areas where smoking is prohibited. As you adapt your puffing style and learn more about the hardware, you can start customising to suit your preferences. Examples of these include decreasing your e-liquid nicotine concentration, selecting a more sophisticated device and/or experiment with different flavours and/or base ratios. How much money will I save by switching to e-cigarettes? Cigarettes: 1 pack of standard cigarettes = £8.50. If you smoke 1 pack per day then that comes out to £3102.50 per year. The cost of lighters, matches and/or ashtrays is assumed to be ~ £30/year. Atomiser last on average 2.5 weeks, therefore you will need to purchase ~ 20 atomisers/year. A 10 pack of Kanger Dual Heads = £19.98 * 2 = £39.96. 2 Benowitz and Jacob (1984) Daily intake of nicotine during cigarette smoking. Clin Pharmacol Ther 35:499-504. 3 Ling and Parry (1949) The amount of nicotine absorbed in smoking. Brit J Pharmacol 4:313-314. 5 Hajak et al. (2015) Nicotine intake from electronic cigarettes on initial use and after 4 weks of regular use. Nic Tob Res 17:175-179. 6 Farsalinos et al. (2013) Evaluation of electronic cigarette use (vaping) topography and estimation of liquid consumption: implications for research protocol standards definition and for public health authorities’ regulation. Int J Environ Res Public Health 10:2500-2514. The Liberty Flights offices have been buzzing over the last few months with passionate discussions about the new mini box mod devices coming from, arguably the two biggest electronic cigarette manufacturers camps. Aspire were first out of the starting blocks with their ESP 30W. Vaping hard down their necks were Kangertech with their SUBOX Mini Kit. As product development manager for Liberty Flights, I spend some of my day, alas I wish it were more, sampling and testing pre-release devices from manufacturers and deciding which to offer online and in our retail stores. After vaping so much liquid that I am now persona non grata in the LF warehouse through these devices I can tell you that the decision was tough. As the ESP doesn’t come with a tank in the kit, I paired it with an Aspire Nautilus. The SUBOX mini comes as a complete kit with Kanger’s own Subtank mini. Before we get to the brass tacks it is fair to say that both are amazing pieces of kit. Both affordable and both ooze style. As a designer and a vaper, a good-looking device is always a must and these two tick those boxes with big ticks. As the ESP was first on the scene I will start with that. As soon as the ESP hit my desk I was impressed, rugged carbon fibre, easy to use settings and excellently shaped to fit in the hand. This quickly became my all day vape. After a couple of weeks use, the honeymoon period had not ended. I found myself with this device everywhere I went. The battery life (1900mAh) was ample; a solid day’s use out at 15 watts (my sweet spot for the Aspire BVC coils). 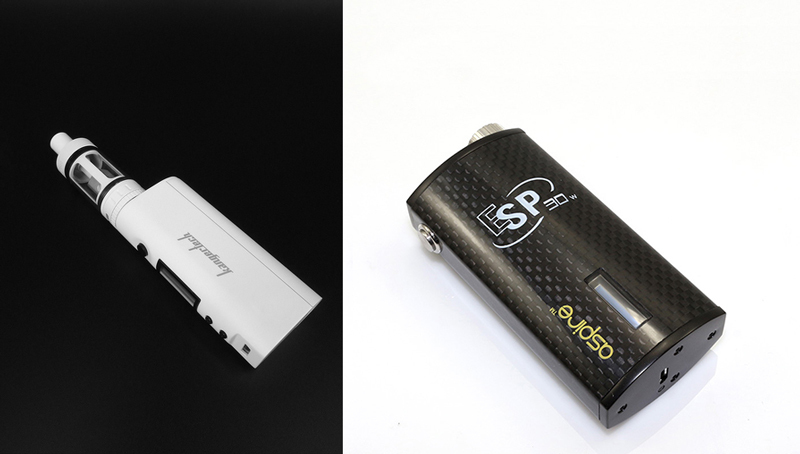 The ESP has a range of 5-30 watts. The consistent power output from the ESP meant that I didn’t need to change the coil, no burnouts at all. Just as I was falling in love with the ESP, I started to hear rumours from a source at Kangertech about a new device they were releasing to compete with the ESP. I was sure that nothing could come between the bond that had forged between my ESP and me. Then it happened. Kanger’s SUBOX Mini glided onto my desk and into my life. As a kit option Kanger have hit the nail on the head with the SUBOX Mini. The kit is an excellent ADV for both new vapers and the experienced alike. The simplicity of the features mixed with the versatility between stock sub-ohm coils and a re-buildable deck, position this as perfect for novice and expert alike. The attention to detail shines through and their eye for design is showcased through the new “Aqueous Ceramic” colour coating. The coloured, re-designed Subtank Mini seamlessly merges with the new K-Box Mini to give an elegant look. No miss-matched tanks and batteries here. Kanger seem to have fixed the well-known leaking issue in the Subtank range with the new design in the Aqueous Subtank Mini, I have used my version relentlessly for two weeks now and it is yet to leak. After two weeks use with each, I was stuck with a difficult decision; pick a favourite. Although both are excellent pieces of kit, and a testament to the expertise and eye for detail of their respective manufacturer’s, my heart is telling me to go with the Kanger SUBOX. The fact this comes as a completed kit really helped with my decision, visually I feel the ceramic coating really helps draw the clearomizer and battery into a single unit. The fit of the clearomizer to the tank has been flawlessly designed and the SUBOX outputs 20 watts more than the ESP. The Aspire ESP will still always be with me as a secondary device but the SUBOX kit will almost certainly, be my ADV for the foreseeable future. That is until something new gets my attention. How fickle one can be when it comes to loving and vaping. How Safe is Your E-liquid? In America the dollar reigns supreme. Here in Blighty, we are fiercely proud and protective of the Pound. But in the vaping world, e-liquid is the currency of choice. Just look at the fuss when new e-liquid gold hits the shelves, sparking a hundred different forum threads, a plethora of YouTube reviews all fighting to be first to have their voice heard by the chattering digital masses and the kind of unceremonious scuffling usually reserved for the annual department store January sales rush. And then, just try ordering some of this new, much-hyped liquid gold. We’ve all experienced that feeling, after we’ve finally bought a ticket to ride on the e-liquid bandwagon, when we reach the checkout only to be told the stock has gone and we’re in a virtual queue for a new batch of stock to arrive. Hopes crushed. Bragging rights suspended. We wonder how many of us at any point along this well-trodden road stop for a minute to consider what’s actually in the e-liquid we so dearly desire? What safeguards are built into the production of this vaping lifeblood that make it fit for use? Did the manufacturer, in a rush to cash-in on its popularity, have systems in place to ensure no shortcuts are taken in the production process? Are there guarantees on quality and consistency? How will it affect your body? What’s in it? Hands up those who haven’t asked that question, even on a single occasion? While most seasoned vapers know that it’s probably wise to ignore much of the junk science offered as fact for easily-digestible consumption in the popular press, do we know enough about what we’re putting into our bodies every day via our mod of choice? Do we know how it is made and how can we be reassured that our interests, rather than the simple lure of filthy lucre, are a priority? Just because there are manufacturers of e-liquid out there who are hugely transparent about their production process, the quality of the ingredients they use and the lengths they go to in order to make their product over-reach safety regulations, it doesn’t follow that everyone who has ever produced e-liquid is quite so rigorous. There are rotten apples in every corporate barrel. And we don’t doubt for a minute that a disruptive lifestyle hero like the vaping movement will, at points along its rapid rise to High Street acceptance, fall victim to the cash-hungry vultures waiting to profit from the next big thing. Here at Liberty Flights we’re hugely proud of our record for premium e-liquid production and also for leading the field with our high standards of production and research. Our chief scientific officer, Monica Vialpando, has been studying the effects of inhalation on the human body for years. Monica, a PhD, is an internationally peer-reviewed published scientist whose previous work has led to her appointment at pharmaceutical companies Johnson & Johnson, Novartis, Genentech and Nektar Therapeutics. Monica is a member of the American Association of Pharmaceutical Scientists (AAPS) and the Belgian Society of Pharmaceutical Sciences. Her science background and research in oral dosage forms, formulation development and the effects of inhalation on the human body means she is the perfect fit for Liberty Flights’ pledge to continue to push the boundaries in both quality and research. Today Monica looks at the subject of e-liquid – in this quick-fire Q&A session she gives her professional perspective on what makes a premium e-liquid like the Liberty Flights XO range so different to the liquids you can pick up for bargain-basement prices. 1. 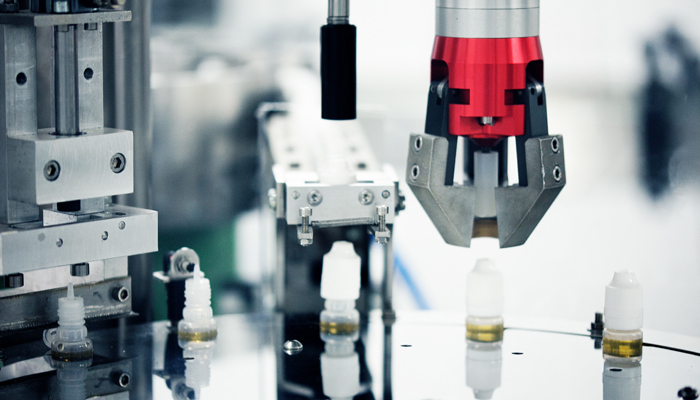 What goes into e-liquid, and how is it produced? There are typically 3-5 components in e-liquids: Propylene glycol (PG), vegetable glycerine (VG), flavouring, in most cases, nicotine and in some cases, water. Liberty Flights have spent considerable effort putting together a specialist team of flavourists who develop our more complex and unique flavours from raw ingredients. Potential new e-liquid flavours will then undergo a process of in-house analysis and testing, plus internal and external reviewing. We may then slightly modify the component ratios until the taste experience is perfected. 2. Liberty Flights’ XO e-liquid is produced to pharmaceutical grade standards, could you give some insight into what this means and what the process is? There are four grades: pharmaceutical, food, agricultural, and industrial. Pharmaceutical grade is the purest available because it contains very little to no impurities. Our PG, VG, and nicotine are all pharmaceutical grade. While pharmaceutical and food grade are both suitable for human consumption, food grade is only designed for ingestion. This is especially important for inhalation, because the lungs are not equipped with the same defense mechanisms compared to when something is swallowed. As with most every day items, the downside is that the user will have to pay more for quality. That is why for example, some e-liquids retail for £1, compared to £4-5 per bottle from more reputable suppliers like Liberty Flights. 3. 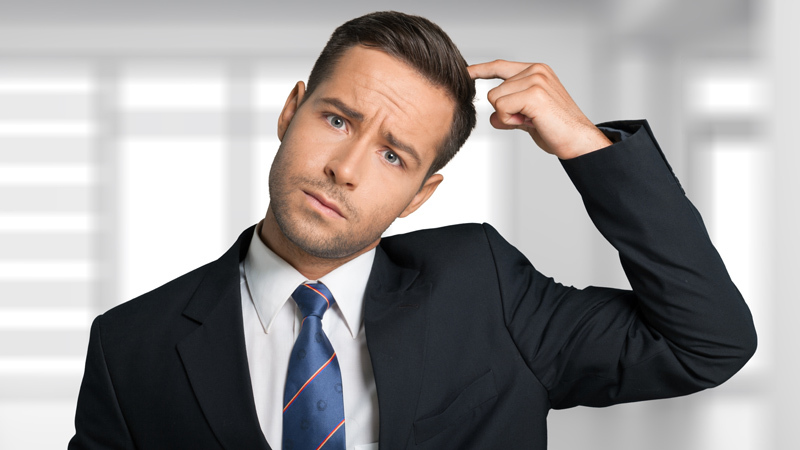 What are the risks of not ensuring full health and safety of e-liquids? As well as the grade type, it is very important to fully characterize the e-liquids, especially flavours. Food grade flavouring is used because pharmaceutical grade is not available. Therefore, it is essential to know and understand the chemical make-up of these flavours. 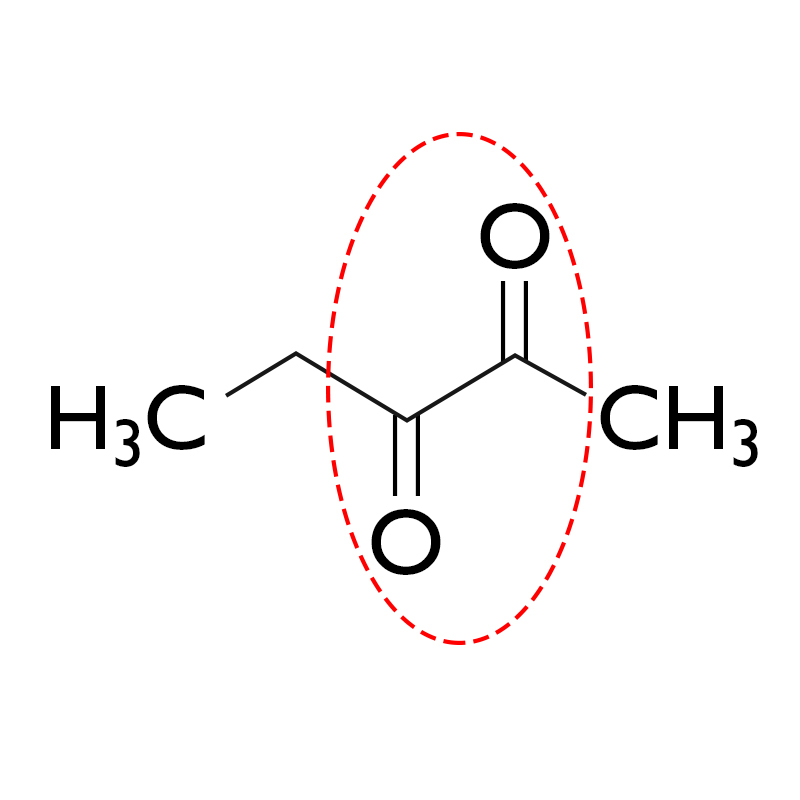 An example of this is diacetyl, a compound that produces a buttery taste. It is found in many foods (e.g. microwave popcorn) but is extremely harmful to the lungs when inhaled. As companies are evaluating new flavours, they need to be able to properly characterize and recognize such harmful substances. Companies need to have access to and proper methods with analytical tools, such as Gas Chromatography Mass Spectrometry (GCMS) to evaluate this. These are the first and most important steps in quality control. Unless routine batch testing is in place, companies won’t know whether they have control of their process, a good example is the routine testing of nicotine concentration and viscosity. Unfortunately, not all companies have these process control steps in place. 4. How has e-liquid changed over the past couple of years? There’s a lot more knowledge around e-liquid safety compared to when the industry started. Also, there are now a wider variety of flavours and unique tastes. For example, drink flavours such as Dandelion and Burdock or Champagne can be replicated with the use of GCMS. 5. What is on the horizon for Liberty Flights’ e-liquid in terms of production techniques and ingredients? Regarding e-liquid safety, we have an agreement with a new independent lab which holds the highest accreditation; Good Manufacturing Practices (GMP), where the shelf life of our e-liquids is tested with the same regulatory stringency as pharmaceutical items. Also, we are continuously developing new and innovative flavours, evaluating current flavours and optimizing our XO range. Adapting to and listening to our customers’ needs is of course of paramount importance to us, to ensure that our XO e-liquid is of the best quality for a premium vaping experience.